4.Now again scroll down to where you see </body> tag. 5.Add below code before </body> tag. 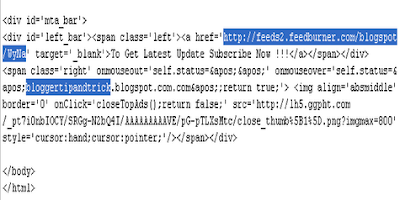 NOTE : Remember to Replace YOUR-FEED-BURNER-ADDRESS and YOURBLOGNAME with your real details.Look at the example below. This is great but the close button on the bar doesn't work for me! I tried it before and after changing fonts and colours on the widget and it doesn't work at all! Everything else works perfectly and is exactly how I wanted it though - thanks! Hoping you could help with the close button issue!